Before we get to the 2013 Orrville Football outlook, I wanted to share a special project I've been working on over the past month. It's the culmination of a project that took many hours of research to compile....and it's something that every Red Rider football fan needs to see. It's my honor to give you the 2013 Orrville Football Fan/Media Guide. It's basically a 12 page reference guide with current info as well as historical info. Click the link below to view the file. You can also save it on your own computer or print it out. Page 4 is Orrville Football "by the numbers" with detailing stats on our playoff history, league titles, etc. Page 11 is a game-by-game breakdown of the Orrville-Wooster rivalry. Again, feel free to print it out or save it to your computer. I'd like to update this annually. Here's the article that I submitted to the most recent issue of OrrViews. I'll add to the article below. 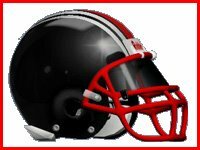 With last year’s 1-win season in the rearview mirror, Orrville head coach Doug Davault and the Red Rider football team are excited to get 2013 season started. Now in his 8th season as head coach with a 51-30 record, Davault feels he has a good group of kids and the right mix and size, speed and smarts to get Orrville football back on track. The four senior captains for 2013 are Trevor Summers (TE/LB), Kyle Ritchie (WR/DB), Harrison Brown (OL/DL) and Joel Zook (RB/DB). They will be counted on to lead the team all year and according to the coach, they’ve already begun stepping into that role. One of the new faces on the 2013 team will be sophomore quarterback Luke Smith. He takes over for 3-year starter Kyle Lichti. Seniors Elijah Coleman, Chandler Smith, Kyle Ritchie and Trevor Summers will be receiving targets for Smith while a group of linemen led by seniors Harrison Brown & Connor Davis, juniors JJ Miller & Amir Simpson, sophomores Jacob Zimmerman, Jacob Hochstetler and Korbin Sprowls will provide protection on the offensive and defensive line. Running backs will be led by Senior Joel Zook with junior Keontae Owens and freshmen Jacob Hershberger & Austin Domer potentially seeing time as well. On defense, senior Trevor Summers will anchor the defense at linebacker. He’ll be joined by juniors Colton Shrader, Jachai Palmer and Corre Shaffer at linebacker, while seniors Kyle Ritchie, Joel Zook, Elijah Coleman and Chandler Smith will man the defensive backfield along with junior Nick Fetty. The Red Riders kick off the 2013 season at home on August 30th against Cleveland John Marshall. This is a slight change in the schedule as Cleveland Lincoln West was scheduled to travel to Orrville, but due to low numbers on their team, it was agreed to replace them with the Lawyers of John Marshall. Orrville will travel to Triway in week 2, this will be the first game on Triway’s new turf field. The Red Riders will round out the non-conference portion of the schedule in week 3 as they host Northwest. The next 7 weeks will be against Ohio Cardinal Conference competition, which will again prove a difficult test for the Riders, who by enrollment numbers are the smallest school in the conference. The annual week 10 matchup against Wooster at Heartland Field will be the first game in the 100+ year rivalry to be played on turf. With participation in the low 40’s counting all freshmen as well as sophomores, juniors and seniors, staying healthy is as important as it’s ever been. Lastly, Davault stressed the need to get the season off to a good start by winning early. I honestly think this could be a team to surprise people this year. There's strong leadership at the top with a large senior class and 4 seasoned senior leaders in Zook, Brown, Ritchie and Summers. It all starts with those 4. All 4 need to have strong seasons on both sides of the ball. I think we have some youth on the team that will have an impact, and some kids that have been waiting in the wings to make an impact. We haze an offense and defensive line with some good size for the first time in a while....how that group gels and opens holes for the run game and protects Luke Smith at QB will obviously be a very important thing. The biggest keys are to stay healthy and to get off to a good start. With low numbers, we have many kids playing offense and defense. This isn't anything new in Orrville, but our depth is very shallow. If a key player gets hurt, it's the equivalent of losing 2-3 kids. A team our size just can't absorb losses like that and be the same team. Getting off to a quick start is so key this year. Our first 4 games are John Marshall at home, at Triway, then Northwest & Lexington at home....we have a real opportunity to get off to a hot start and you never know how the season will go if that happens. We've seen what confidence (and yes, swagger) can do to a team. If this team gets off to a good start and sees the results of their hard work paying off in wins, it could be a very interesting season. With the addition of a 7th division, Orrville is now a D-5 school, playing a largely D-2 and D-3 schedule. It's not inconceivable to go 5-5 and make the playoffs. We'll be the smaller school in terms of enrollment, 10 out of 10 weeks this year.....and the OCC will be as competitive as ever. This wont be an easy road. Our kids are never afraid of a challenge and will not back down. We will never be the biggest school, but I'll take the heart of our kids any day of the week. These are good kids who have worked hard to get here and deserve our support. Nobody wants 1-9 again and these kids are going to do everything in their ability to not let that happen. Let's start with a win Friday night, on our turf, and have a healthy roster walking off the field after the game, heading to Triway for a week 2 showdown with the Titans on their turf. I'm wondering why you call the Facebook page Orrville Red Rider sports blog when you only report on football and volleyball. There are other sports going on too but just because they don't have great records there is no mention of them playing. Reporting should be consistent of all sports and all results, not just wins. Wining and losing are a part of all sports so report it all for all athletes!! Feel free to contribute to the site in a positive way. If there is news on other sports you feel aren't being covered to your satisfaction, step up & be willing to contribute. I put my email on this site so anyone wishing to contribute may do so. My time to work on this site is as limited as it has ever been & football, basketball & volleyball are the sports where information can be most easily found. In the mean time, continue to enjoy your free subscription to this site, my facebook page and my twitter account. If you feel you could improve on what I do here, feel free to start your own site and you can make all the rules you want. I guess I do get defensive when people attack my work behind an anonymous veil. Easy to be a big mouth then. OrrViews allows anyone to submit pictures and stories, there's another opportunity to spotlight a sport you feel doesn't get the attention it deserves. I commend all our student athletes for their hard work in their chosen sport...I'm just never going to be someone who goes to all the games and covers them. That's a perfect fit for a high school journalism student or a parent of an athlete. I'm neither. Again, rather than complain, take the initiative.